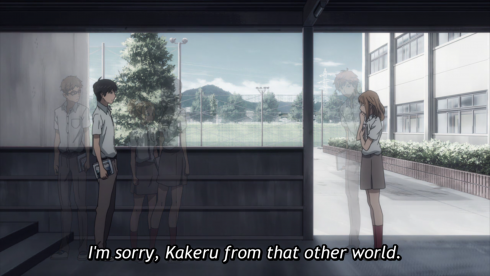 By the time the episode starts, Kakeru has already broken up with Ueda, meaning he and Naho are free to hang out again. They do what a lot of friends do, testing the waters of a romantic relationship without either having to officially call it that. Kakeru first takes the initiative, inviting Naho along for a study date and giving her a barrette as thanks for all she’s done for him (and their friends are only too happy to give the pair some alone time, too). 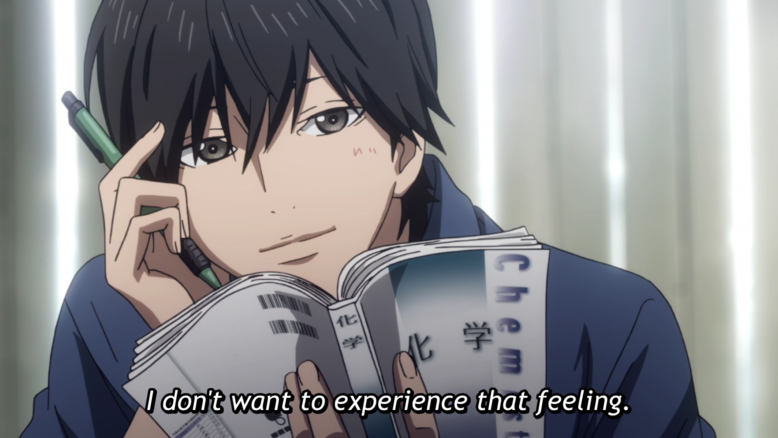 Kakeru is in a kind of holding pattern as far as character development goes (he is focused on the past, after all), but we do get some steady but important progress for Naho, who’s got her eyes on the future. She decides to be proactive twice this week, first when she invites Kakeru to watch the fireworks together and then when she works up the courage to wear the barrette. Importantly, the second one isn’t even in the letter–it’s a choice she makes all on her own. Also, because it’s impossible for me to talk about this show without a personal angle, Naho’s hesitation about wearing flashy or overtly “girly” clothes like the bright shorts and the shiny barrette is a lovely touch of realism. As someone who doesn’t like calling attention to their appearance, I understand that push-and-pull between wanting to look cute (for yourself and others) and being more comfortable sliding under the radar. Props to Naho for working up the courage to do what she wants this week. 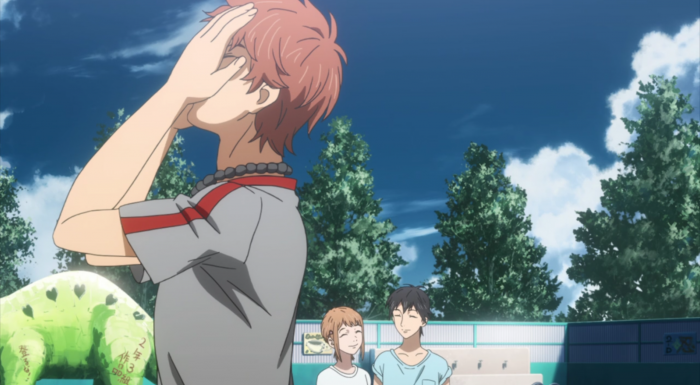 Really, though, the character focus of the episode was on Suwa, who’s feelings for Naho are front and center this week. I mentioned last episode that the love triangle with Ueda oversimplified the situation by making her such a straightforward villain (a trend that continues this week), but in some ways it does serve a purpose since it contrasts what we see this week: A love triangle that really isn’t a triangle, because Suwa has no intention of acting on his feelings, at least as long as Naho and Kakeru are so obviously into each other. I’m not a huge fan of love triangles in general, but if you’re going to do one, this is the way to do it: With sympathy and nuance for each character. These are all good kids, and no one is right or wrong or “better” for anyone else here. 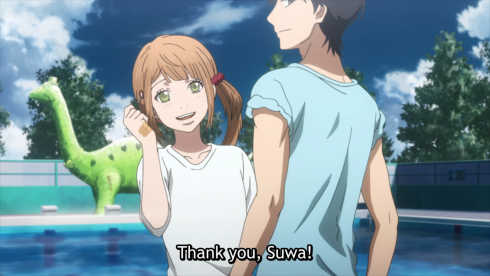 Plus it’s great to see stories where the unrequited crush (Suwa) respects the feelings and choices of that crush (Naho) and doesn’t try to force his way into her life. orange is doubly smart not to play the “suffering martyr” angle, which would have been just as unhealthy as aggression. 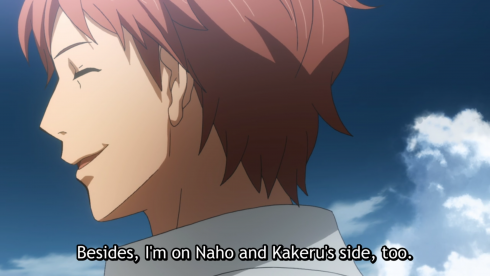 Instead, Suwa really does seem to be “on their side” just like he says. 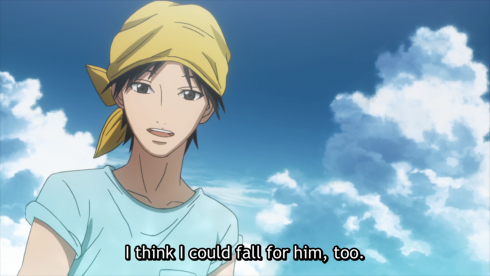 It’s not that Suwa’s sacrificing his own happiness or making himself miserable for someone else’s sake, but that he’s decided his friends are more important to him than pursuing a romance. Seeing the people you care about find happiness is a joy of its own, and I like that orange understands that. Beyond typically strong character work, the gang’s science teacher also drops some Theories of Time Travel on us, bringing diverging timelines and parallel universes into the canon. This helps handle any time paradoxes (like Naho’s letter staying the same even though events have begun to change), but it also means that Naho’s quest is, in many ways, an impossible one. 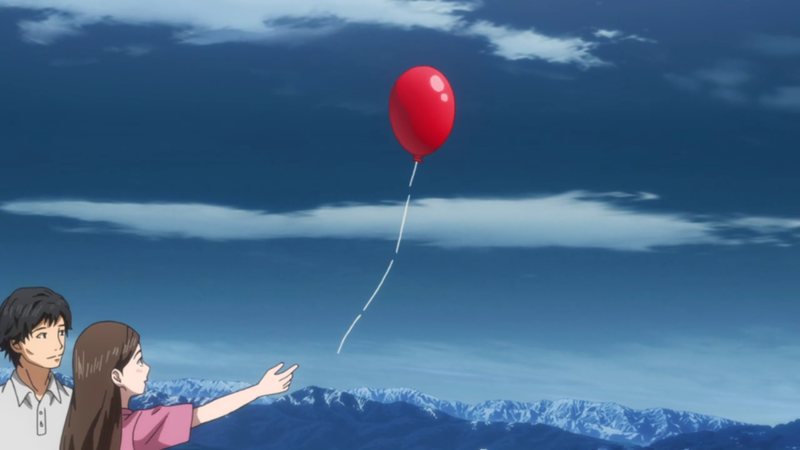 She can’t erase the regrets of the Naho who wrote her that letter, because as soon as she started to change things she spiraled off into her own, new timeline. 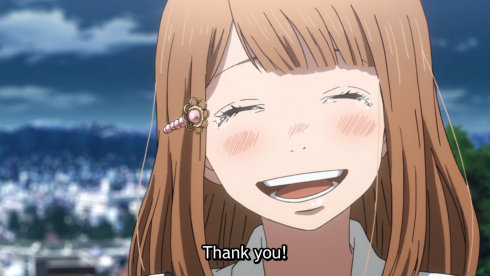 It’s a bittersweet realization for Naho and the audience, but in some ways I think it’s freeing, too, and not just because it means that somewhere Naho and Suwa can still have an adorable kid together (although don’t get me wrong, that is a nice perk). 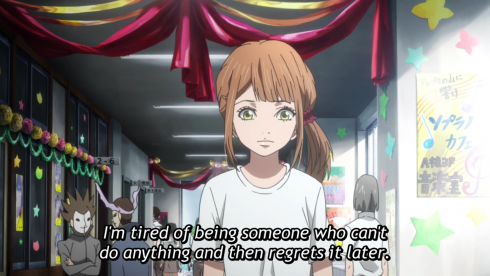 Our Naho doesn’t have to worry about disappointing anyone or trying to “save” her future self anymore. She can keep using the letter as a guidebook, but now she’s doing it for herself and the Kakeru of her time, not for hypothetical future selves. orange has mostly been a story about regret, but it doesn’t have to be. Instead, it can be about being present in the here-and-now, and living for yourself and your own future. 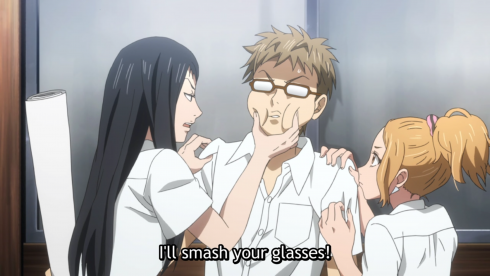 Naho is beginning to learn that. Better still, she’s beginning to act on it, too. orange‘s director also directed Steins;Gate, so seeing a dark-haired guy in a lab coat talking about time travel theories just made my day. I have sooo many thoughts about orange‘s use of the parallel worlds theory, but at the risk of accidentally spoiling something, I’ll save them for later in the season. Put a pin in that one for sure, though. Word has it orange is in Production Hell, outsourcing a lot of work and requiring multiple animation directors for single episodes. So if you noticed a lot of choppy or off-model moments this week, that’s why. They still made time for some lovely shots and angles, though, with a strong focus on blue skies and waters to suggest the openness of the future–a thought that can be both as uplifting as it is overwhelming. 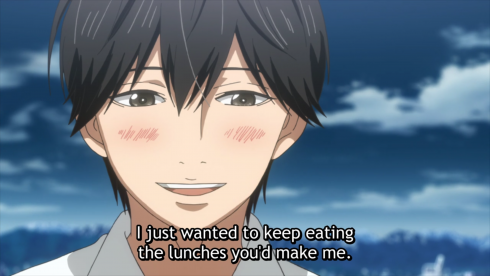 The Sensei Next Door: Kakeru is absent for a week because it’s the “49th day” after his mother dies. This comes from the Buddhist belief that it takes 49 days for the spirit to be reborn again, so it’s typical to have a memorial service to commemorate this day. Over the years, the “49-day ceremony” has been worked into modern Japanese funeral practices, so it’s fairly common to have one regardless of the family’s religious beliefs.